↑ ୧.୦ ୧.୧ WHO Model Formulary 2008 (PDF). World Health Organization. 2009. p. 396-397. ISBN 9789241547659. Retrieved 8 January 2017. ↑ ୨.୦ ୨.୧ Dart, Richard C. (2004). Medical Toxicology (in ଇଂରାଜୀ). Lippincott Williams & Wilkins. p. 250-251. ISBN 9780781728454. ↑ British national formulary : BNF 69 (69 ed.). British Medical Association. 2015. p. 43. ISBN 9780857111562. ↑ Gad, Shayne Cox (2007). Handbook of Pharmaceutical Biotechnology (in ଇଂରାଜୀ). John Wiley & Sons. p. 692. ISBN 9780470117101. ↑ "Antivenom Serum". International Drug Price Indicator Guide. Retrieved 8 December 2016. ↑ Lewis, Danny (11 September 2015). "Why A Single Vial Of Antivenom Can Cost $14,000". Smithsonian. Retrieved 9 January 2017. 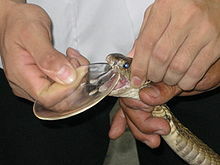 ↑ "One step closer to cheaper antivenom". ScienceDaily. 3 September 2015. Retrieved 9 January 2017.